Yann Tiersen - ALL. Vinyl LP, CD. Bleep. Perhaps best known for his work on the wildly popular soundtrack to Jean-Pierre Jeunet’s 2001 romantic comedy Amélie, multi-instrumentalist composer Yann Tiersen has since become a major figure in modern classical music. All continues his empathetic project after 2016’s EUSA, consisting of exuberant and searching piano works, melded with candid field recordings taken from forests in Devon, an abandoned airport in Berlin, and various spots in his native Brittany. This truly lovely work also features guest vocal work from Anna von Hausswolff. 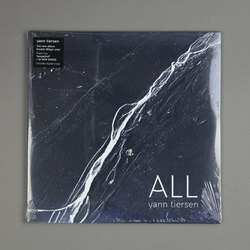 Yann Tiersen announces details of a brand new album, ‘ALL’. ‘ALL’ is the first album to be recorded at Tiersen’s new studio, venue and community centre, The Eskal, built in an abandoned discotheque on Ushant, a small island positioned in the Celtic sea between Brittany and Cornwall, Tiersen’s home for the past 15 years. The album, mixed and produced by Tiersen and Gareth Jones, continues the themes of environment and a connection to nature explored across many of his albums but especially on 2016’s ‘EUSA’. Incorporating field recordings from Brittany as well as from a forest of redwood trees in Devon (on ‘Koad’, recorded at Schumacher College, part of the Dartington Hall Trust) and at the decommissioned Tempelhof airport in Berlin (‘Tempelhof’). For ‘Usal Road’ Tiersen returned to a particularly significant spot in California (Usal Road, situated on the Lost Coast) to record violin. This place holds symbolic meaning to Tiersen after he was chased by a mountain lion there in 2014, an event which triggered a renewed and deeper connection to nature and specifically our humble place within it. Predominately sung in Breton, the album features several guest vocalists: Anna von Hausswolff (‘Koad’), Ólavur Jákupsson (‘Erc’h’) and Breton singer-songwriters Denez Prigent(‘Gwennilied’), Emilie Tiersen and Gaëlle Kerrien. Yann Tiersen’s last album release, ‘EUSA’, was preceded by two sold out dates at the Barbican in London and Yann Tiersen has continued to perform in some of the world’s most prestigious venues and festivals, including the Edinburgh International Festival, the Berlin Philharmonic, Officine Grandi Riparazioni in Turin, Teatro Principal in Zaragoza, Odeon of Herodes Atticus in Athens, Sydney Opera House and the Grand Hall of the Philharmonia in St Petersburg. His upcoming London dates will see him return to the UK for the first time since his performance at the Royal Albert Hall in 2017.